Here is my Aussie xtracycle. It is one of maybe two in Perth, Western Australia. It is bolted to a Giant STP2 - though I have since changed out the forks to some rigid Salsa steel forks, and added a Brooks saddle. A drivetrain upgrade is also in the wings - at the moment am running Acera but it doesn't seem to deal with gear changes very well. I'm looking at going to 9 speed and going to SRAM X9. 464 is another one local to you - in freo with the odd foray north of the river. I run an 8 speed set-up with SRAM (original to the parent bike) - seems to work ok.
Hey Tom, nice bike! I just added a chain tensioner and it seems to be running better :) I still want to upgrade before I take it on more remote tours. Planning to ride to Adelaide for the Tour Down Under next year! I'm planning on big off-road tour (Continental divide in USA/Canada, then keep going until out of time) starting mid-year. Have done some sections of the Munda-biddi with it as is and it does pretty well. Still slightly nervous that it won't be robust enough, so may get some pre-emptive reinforcing done - or much to my wife's disgust, upgrade to a Big Dummy. Will rag it over lots of off-road stuff in the next few months and see if it holds up. Your Adelaide trip should be good too - how on-road is it? Munda-biddi's interesting at the moment - deep dry pea-gravel's not fun. The Xtracycle is really well balanced though so you just slow the revs until traction is happening. Better than my wife on her duel-suss with trailer. Trailer for a kayak should be easy with the X - not that I've tried it yet.... but I have a plastic WS Tsunami 145 which I plan on strapping to the kayak trolley, and then using a short bit of pipe as a draw bar with a rope through the middle, tie one end to the kayak toggle and the other end to the X.... I've been thinking about doing this for ages, I should probably try it out on the weekend. Perth -> Adelaide, all on road except when getting out of the way of road trains. 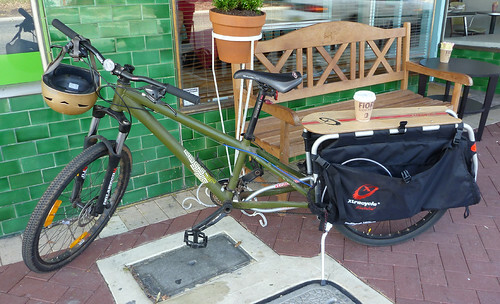 The X handles so well compared to a regular racks + panniers set up that it's the best choice!